Save on Hello, Dolly! on Broadway tickets before you travel to New York. Buying theatre tickets online is safe, easy and, above all, saves you time and money! This long-awaited revival of Hello, Dolly! is showing in the Shubert Theatre. The musical is a resurrection of the highly acclaimed show that first made its Broadway début in 1964. 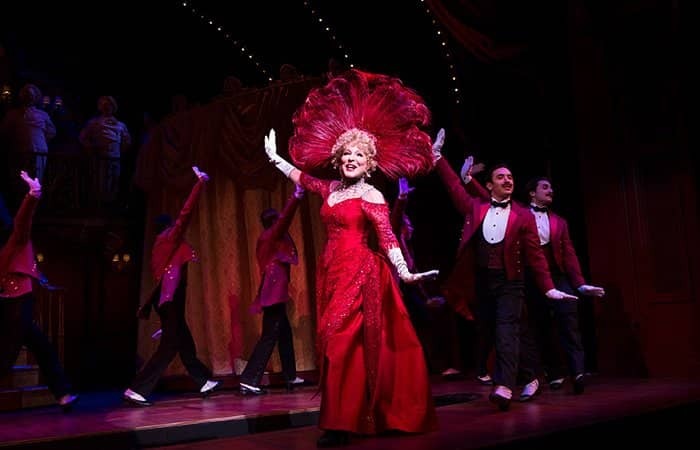 The revival of Hello, Dolly! is choreographed and directed by two Tony Award winners. Dolly is a professional Matchmaker who has found the perfect match for her newest client: herself! The story of the musical takes place at the end of the 19th Century, in the city of Yonkers, New York. Rich and grumpy widower Horace Vandergelder is looking for love, hence he decides to employ the matchmaking services of Dolly to find his new partner. As a result of their first meeting, Dolly realises that she, in fact could be the perfect match for Horace. Consequently, she takes on the ultimate challenge of encouraging him to come to this realisation himself. Can Dolly succeed in winning the heart of her most important customer? It’s easy to buy tickets. Above you can select the date that you want to go. You’ll get an overview of all the tickets available. You can then choose how many tickets you would like, add them to your cart and pay right away. After paying, you’ll receive a confirmation and your voucher by email right away. You’ll exchange the voucher for tickets at the theatre on the day of the show, at least one hour before the show starts.